This article explains how to generate a range for Float Numbers in python. I have written a couple of example programs in python which will demonstrate how to use floating point number in a start, stop and step argument of custom range() function to print a range of floating point numbers. 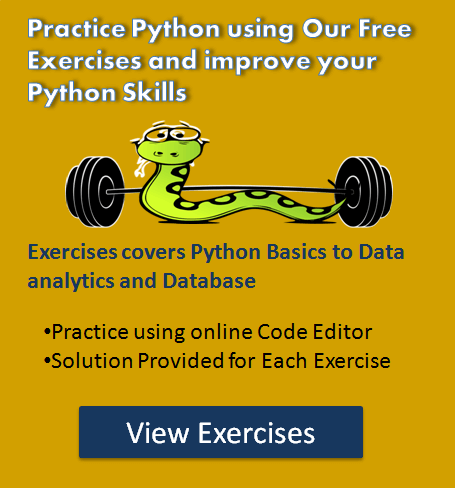 Examples mentioned in this article apply to all versions of python i.e., Python 3 and 2. Before moving to example first understand the limitation of the existing range() function to handle float values. The main limitation of Python’s range() is it works only with integers. Python range() doesn’t support the float type i.e., we cannot use floating-point or non-integer number in any of its argument. For example, Let’s see the following source code. 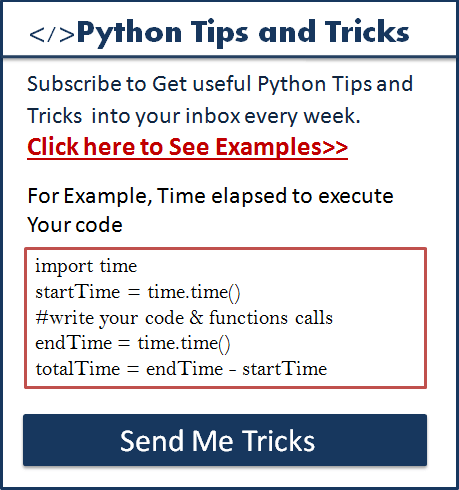 If you try to execute above code Python will raise a TypeError: ‘float’ object cannot be interpreted as an integer. Now, Let see how to generate the range for float numbers? There are various ways to do this Let see one by one with the examples. Use numpy’s arange() function to generate the range for float numbers in Python. We can use the numpy module of Python programming language to get the range of floating-point numbers. NumPy library has various numeric functions and mathematical functions to operate on multi-dimensional arrays and matrices. NumPy has the arange() function to get the range of a floating-point number. arange()function has the same syntax and functionality as python range() function. Additionally, it also supports floating-point numbers in any of its argument. i.e., we can pass float number in the start, stop and step arguments. Let demonstrate the use with the following example. Note: NumPy isn’t a part of a standard library of python (i.e., it doesn’t come with default python installation ) but is relatively easy to use. To use this function you need to install NumPy module using pip. pip install numpy. A numpy is a third party package and adds overhead concerning dependency-management when you want to use an arange() function. So if you don’t want to use NumPy just for arange() function, you can code your function to generate a range of float numbers. I have created such examples. I have written a sample code which uses simple logic to generate the range of floating-point numbers. This code works for both positive and negative float values. This Program divided into 2 Sections. the first section contains function frange(). another section contains testing a frange() using Floating point number with the following approaches. Positive float values in range() arguments. With negative float values in range() arguments. Negative and positive float step value in frange() arguments. 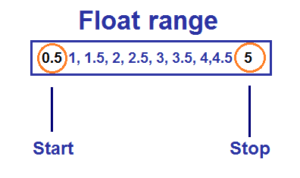 Display float range in reverse order. You can define a generator same as python range(), i.e., range(start, stop, step) that accepts floating or fraction numbers and produces numbers. In this example, I am using types + and < for positive values and type - and > for negative float values. I have created two separate function frange() for both the positive and negative float step. Program to generate a range of only positive float numbers using a generator. Program to generate a range of only negative float numbers using a generator. Same like integer step value we can use floating-point step in your custom range function. Using float step size, you can generate floating point numbers of a specific interval. Let see how to use floating point step in python range() with an example program. In this example, the step value is 2.5. The following code is useful for those who are not much familiar with python. Let execute above code to get the range of positive and negative decimal point numbers. Thank you, This is was i want. now i can use generate a range for float numbers. i am using numpy’s arange() for this.